Our roving reporters, Diane and Roger Brown, have been exploring Kaštela, near Split. Here’s their report. Having heard the news that the Royal Navy’s HMS Cornwall was about to visit Split, we were excited to see her approach on Tuesday 6th February, from the vantage point afforded from our house in Slatine, on Čiovo Island. One of the many advantages of our relatively new Croatian lifestyle and home is the commanding view we have of the maritime traffic passing in and out of Split’s busy port. We were able to follow HMS Cornwall's progress to a berth at the Lora Naval Yard, escorted by two local tugs, who, fussed around her like mother hens. During the ship’s visit, it was planned to re-enact a 'pulling race' that took place in 1933 between HMS Ceres and the Vela Luka Rowing Club. It seems that this event has never been forgotten. The next day we decided to drive to Split and take photos of the ship but could not a get a good view into the confines of the Naval base. On our return from Split we stopped at Kastel Sučurac, where we were able to see HMS Cornwall from across Kaštela Bay. Whilst there, we decided to explore the old town and were well rewarded - as we climbed the steps to the old town wall, we stumbled across a children’s art exhibition from local mainland and island schools. We were given a warm welcome by Dragan Delić who told us much of the local history of “Little Dubrovnik” as he called the town. On our departure he told us that we were his first English visitors and presented us with a book on the history of Kastel Sučurac, which, he signed for us. Such hospitality. Kaštel Sućurac is well worth a visit, the old town being comprised of a warren of narrow streets and historical buildings. You’ll find Kaštel Sučurac on the back road from Trogir, via Split Airport, to Split Town. It’s the last of the seven Kaštel villages, each with at least one castle. From the main road you’d just guess it was an uninspiring industrial area but that’s part of the charm of Croatia and its many undiscovered gems. Roger and Diane are good friends of Croatia Online and have a superbly located house, with a self contained holiday apartment to let, in Slatine on Čiovo Island, near Trogir. Just a three minute walk from a great beach, with its own bar and restaurant, the apartment is tastefully and generously fitted out with all mod cons and comfortable furnishings. And you couldn’t ask for better hosts! For more information on HMS Cornwall and Kaštela, see our recent earlier postings. For more information on Roger and Diane’s apartment go to Holiday Accomodation Trogir. 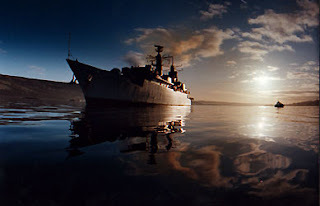 Thanks to the RN website for today's photo of HMS Cornwall. She was built in BAE System's yard at Scotstoun Glasgow. Go to BAE Systems for more information on them.